Tessalation! tells the story of a little girl named Tessa Truman-Ling, who is sent into the backyard to play. There, she discovers a thrilling beauty in the patterns created by a beehive, piles of leaves, a school of fish, mushrooms and turtles. These amazing repeating patterns fill the book in glorious color, demonstrating just how interesting a mathematical concept can be. 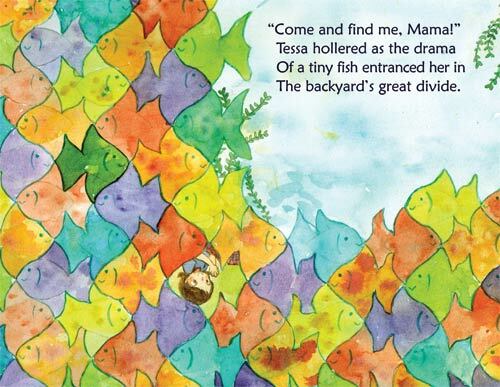 Delightful to read aloud and with instructions to make your very own tessellating pattern at the end of the book, this living math book is sure to engage both adults and children. Very highly recommended!